Earth Day was so last week ... but you can still hop on the conservation bandwagon with this cutie patootie change purse from BlueQ. 95% of its 'essence' comes from recycled post consumer material (yum...er, not! 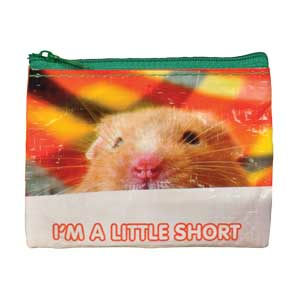 ), but it's got that sweet little hamster fella in all his crinkly adorableness...so that's all good enough for me regardless of what that recycled mumbo jumbo means!